Our bed bug heat treatment is the best solution for same-day elimination. Our heat treatments have a 99% success rate and are backed by a 60 day warranty. Unlike our chemical treatment, you won’t have to worry about a prolonged elimination period that requires multiple treatment applications. Our heat treatments have effectively eliminated bed bug infestations in homes, hotels, apartments, and dorm rooms, where the residents could come home and sleep soundly that same night. We’ll start with a thorough inspection to confirm bed bug activity in your home. After confirmation, we use discreet, portable equipment to heat your home above 125 degrees for at least 90 minutes. Fans circulate the heat to reach all of the cracks and crevices bed bugs may be hiding. Throughout the treatment process, our heat specialists will monitor the temperature throughout your home to ensure all rooms are being heated properly. We combine our heat treatment with a chemical application so that any remaining bed bugs you could potentially bring in from your car or your work are eliminated as well. 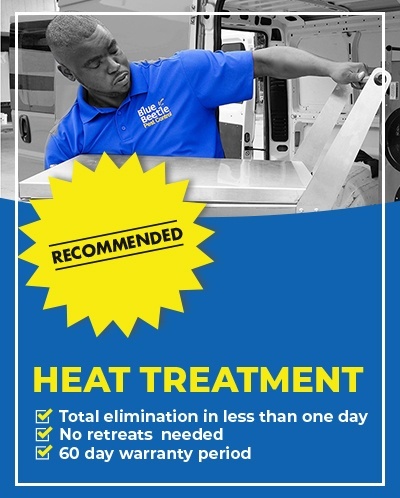 Our heat treatment process does require you to be out of your home for about 8 hours, but you’ll come home to the peace of mind knowing you’re bed bug free! A heat treatment requires much more preparation than a chemical treatment, considering there are lots of things that can be affected by such high temperatures.